Innovative window treatment designed for large windows. Elegant panels of fabric move along tracks and are collected laterally. The sliding panels are specially designed to decorate large windows as well as to divide areas. 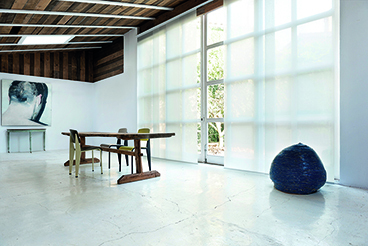 Without compromising light control and sun protection, Sliding Panels are offered in a wide range of fabrics: transparent, translucid and blackout. There are many colors, textures and design alternatives to match the decor. Available in state-of-the-art manual and motorized drive systems.